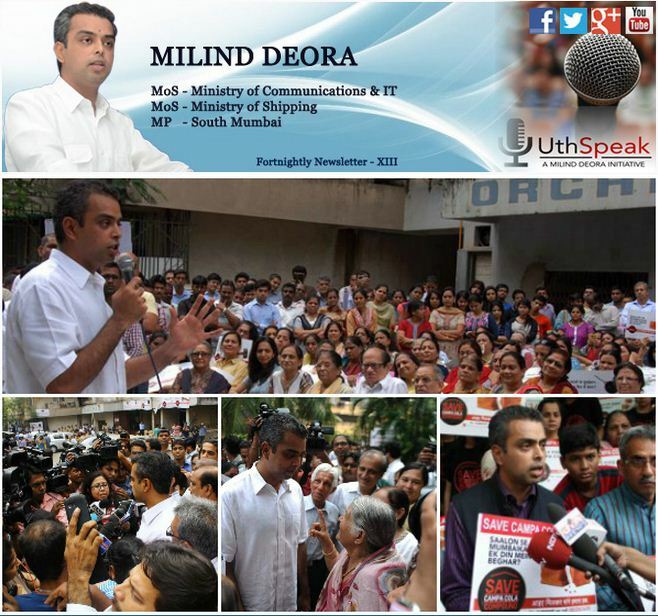 The persistent and unrelenting efforts of Mr. Milind Deora in support of the Campa Cola compound residents finally bore fruit on 13th November, 2013 when the Hon’ble Supreme Court took suo moto cognizance of the issue and stayed the demolition proceedings which were being undertaken by the Bombay Municipal Corporation (BMC) at the compound in Worli, Mumbai. 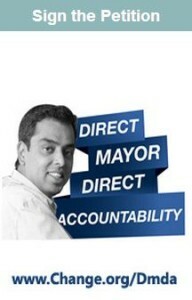 Mr. Deora has been supporting the residents since earlier this year. He facilitated a series of meetings with the Campa Cola residents and the Chief Minister Mr. Prithviraj Chavan where Mr. Deora requested the CM to adopt a sympathetic attitude towards the hapless residents. Mr. Deora also arranged for a meeting between some residents and the Congress Vice-President Mr. Rahul Gandhi in New Delhi. Mr. Gandhi spoke with Mr. Chavan as well but the final Supreme Court order prevented quick action on the ground in support of the people. Eventually, in a desperate bid to save the Camp Cola residents from the imminent demolition squad Mr. Deora wrote to Mr. Fali Nariman, Senior Counsel, Supreme Court of India, Mr.Darius Khambata, Advocate General, Maharashtra, Mr.Kapil Sibal, Minister of Communications & IT and Law Minister of India and last but not the least to Mrs. Sonia Gandhi, Hon’ble President All India Congress Committee, after taking the Congress vice-president into confidence. In this letter, Mr. Deora pointed out that the CM needed to explore all legal options available much faster if a favorable outcome for the beleaguered residents was to be hoped for before the 11th of November 2013. He also made his stand on the issue and the predicament of the people known through social media in an attempt to galvanize support for them. In the meanwhile before Mrs Gandhi could take a decision, Mr. Chavan who is in charge of the urban development department gave permission to the BMC commissioner Mr. Sitaram Kunte to seek police protection and start the demolition of illegal floors after cutting off water and electricity connections. 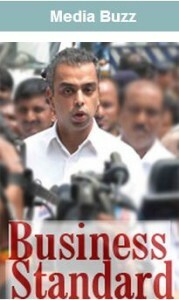 Mr. Deora’s initiative to seek Sonia Gandhi’s intervention proved to be a game-changer after a traumatic day for the residents and supporters who actually had to put up a physical fight to resist the team that arrived at their doorstep to initiate demolition proceedings. Some even courted arrest. The dramatic Supreme Court stay order on the 2nd day was greeted emotionally with tears and relief by the residents who expressed their gratitude to Mr. Deora and others who had supported them in their long weary battle against injustice to save their homes. Mr. Deora has pledged continued support to the Campa Cola residents’s till a permanent solution to their problem is found. Within a matter of a few days the cheer has given way to gloom with the Supreme Court having ordered the demolition in May 2014. Mr deora has maintained right through the high drama that till the builders and the officers in the BMC responsible for this situation are not punished the matter cannot rest. 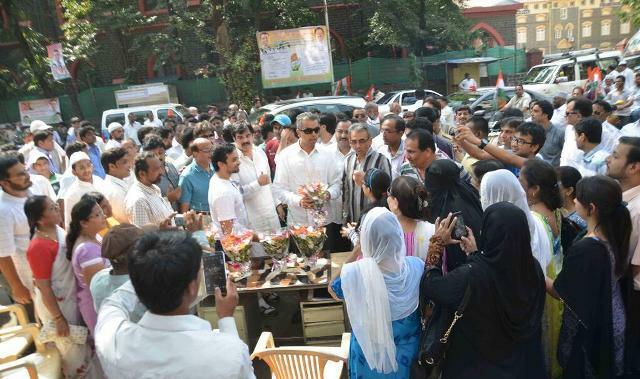 Mr. Deora met with residents of Byculla and Love Lane on the auspicious occasion of Kartik Poornima on November 17th. Local Municipal Councillors, Seniors officers from RTO and Mahanagar Gas were also invited to address the citizens’ grievances regarding Traffic, illegal parking of taxis and Gas Pipeline issues. The respective officers were then requested to interact with residents to resolve their issues at the earliest. Mr. Deora also discussed the potential hazards of Cell Tower Radiation to raise awareness of this issue in a responsible fashion. 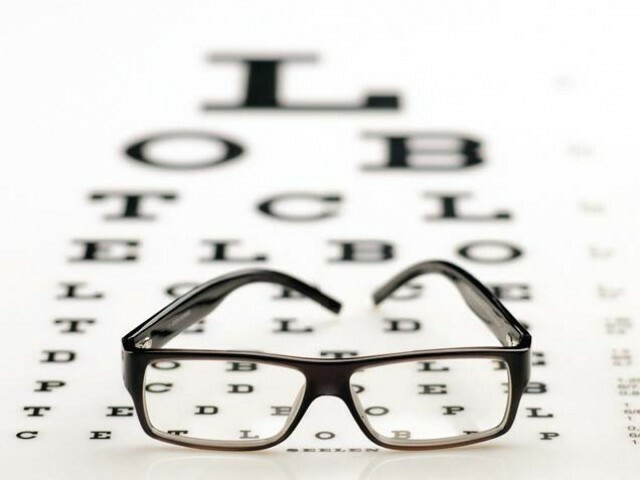 Mr. Deora on 17th October, 2013 organised a free eye check-up camp in Madanpura, Mumbai where 6770 spectacles were distributed and 187 cataract surgeries were scheduled for the underprivileged people. More than 80 such eye camps have been completed across the Mumbai with an average attendance of about 3000 people per camp where spectacles and medicines are distributed and cataract operations are undertaken free of cost. 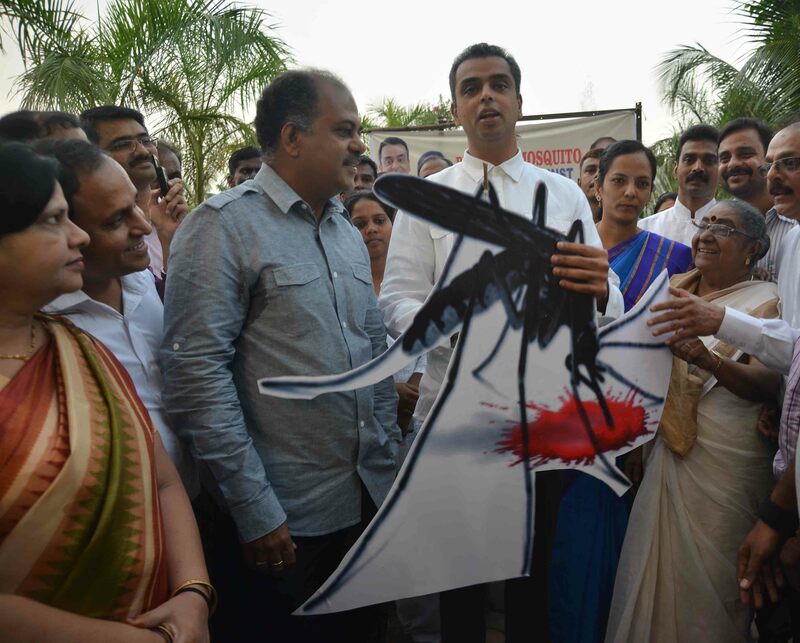 Mr. Deora on 29th October, 2013 inaugurated a ‘Burn the Mosquito’ campaign for the awareness and prevention of dengue and malaria which was organised by the Mumbai Regional Congress Committee (MRCC) Spokesperson Vinod Shekhar. 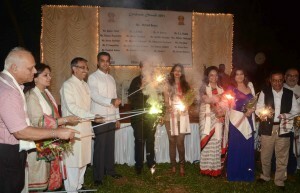 The event took place at CPRA Bay View Marine in Cuffe Parade and the chief guest for the event was MLA Annie Shekhar. He expressed admiration for street play actors and volunteers who are touring Mumbai’s slums and buildings for spreading the awareness. An effigy of the Aedes aegypti, the mosquito which can spread dengue fever and other vector borne diseases, was burnt. Mr. Deora on 30th October 2013 celebrated Diwali with the senior citizens at Nana Nani Park, Girgaum Chowpatty. He specially thanked Mr. Shyam Singhania, founder trustee of Nana Nani Foundation, public charity trust for endeavoring to improve the “quality of life” of Senior Citizens, and for organising the event. 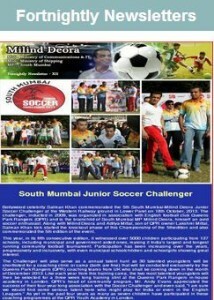 Mr. Deora on 5th November 2013 congratulated I.S.R.O. for the successful launch of Mars Orbiter Mission (MOM), also known as Mangalyaan. Praising the scientists at I.S.R.O. for completing the indigenous mission in record 15 months and at a comparatively cheaper costs, which will make India the first Asian and fourth country in the world to reach Mars, he called it a ‘proud day’ for India.